Michael Franti has a discography that numbers nine studio albums with his current band, Spearhead, as well as one album with his first group, the Beatnigs, and a pair of titles with the influential group that preceded his solo career, the Disposable Heroes of Hiphoprisy. But he’s never had a recording experience quite like the one he had in making his latest album with Spearhead, “Soulrocker,” with producers Stephen “Di Genius” McGregor and Dwayne “Supa Dups” Chin Quee. Bringing in outside producers was a new twist for Franti, who always had handled those duties himself on the previous albums. But the idea of working with McGregor and Chin Quee seemed too good to pass up. Chin Quee actually had come into the picture at a Michael Franti & Spearhead concert. That journey began with the short-lived industrial/punk/spoken word group, the Beatnigs, followed by the Disposable Heroes of Hiphoprisy, a critically acclaimed, politically charged group that released two albums and opened for U2 on its Zoo TV tour. Franti retained his political/topical emphasis after going solo in 1994 and forming his band, Spearhead. Early on, many of Franti’s lyrics were serious, and sometimes critical and angry, but the tone of his messages has softened. While he’s still plenty topical on the new album (“Good To Be Alive Today” is a prime example), the emphasis now is more often positive, encouraging people to work together and use the power of love to change their lives and the world around them for the better. “Soulrocker” songs like “We Are All Earthlings,” “Still Standing,” “Summertime Is in Our Hands” and “Love Will Find a Way” all fit the idea that people can change things for the better. The shift has been intentional, Franti said, and came, first of all, from what he saw on trips over recent years to places such as Iraq, Israel, Palestine and Africa. As he played songs for people he encountered, he found they weren’t interested in commentary about the world’s problems so much as they wanted to hear upbeat, danceable music they could enjoy as an escape. The term “Soulrocker” is specifically meant to emphasize that idea. 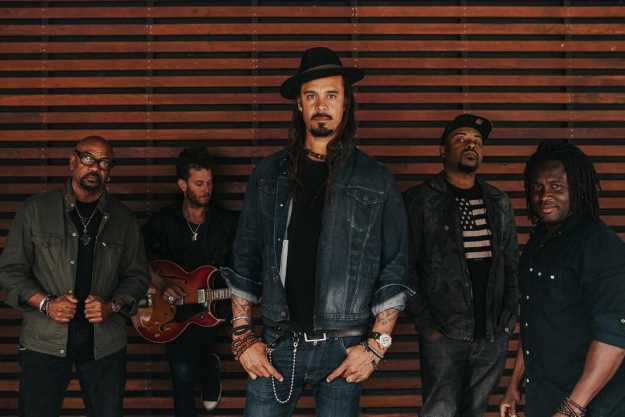 That kind of enriching, communal vibe is what Franti and Spearhead will seek to create with their live shows this summer, including Thursday night at the Cuthbert Amphitheater. And Franti has incorporated specific elements in the concerts to help achieve that goal. “That’s why I spend a lot of time at our shows getting into the audience,” he said. “So I get my headset mike on and I get my acoustic guitar. I run to the top of the venue. I go all throughout whatever place we’re playing. We set up stages in multiple parts of whatever venue we’re in and get out there and play on them. For me, it’s a really great way to feel like I personally am connected, and it’s also a great way to break down that barrier between the stage and the audience.